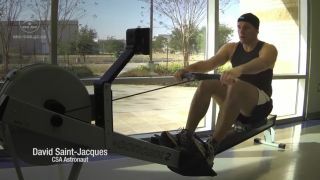 Canadian astronaut David Saint-Jacques uses the Astroskin, an autonomous medical monitoring system, during exercise. Remember that pivotal scene in the movie "Apollo 13" in which crewmembers rip the biomedical sensors off their bodies? In a few years, the same procedure could be as easy as taking off your shirt, scientists with the Canadian Space Agency say. Astroskin, a prototype device to monitor astronaut health, is a garment that fits over a person's upper body and is embedded with wireless sensors. From the ground, doctors can see an astronaut's vital signs, as well as how well the spacefarers are sleeping and how they are moving. You can see a video of how Astroskin works here. Astroskin is a wearable technology being explored by the Canadian Space Agency to help astronauts keep track of their health and biosigns in space. The technology could also be used for medical exams in remote locations on Earth. Crewmembers of the the XPAntarctik expedition, while spending 45 days in a previously unexplored region of the continent, are beaming their medical information back to civilization while wearing Astroskin. The expedition, which kicked off on Feb. 2, is quite a workout for the eight-person team, which has vowed to use no motorized vehicles. This means the suit is getting tested during skiing, walking and climbing Antarctica's jagged peaks and glaciers. The University of Quebec at Montreal is monitoring the suit both from the Antarctic and in its labs, and will share the data with the CSA for possible use on future space missions and other applications. Carré, meanwhile, could refine the technology beyond its initial prototype for CSA. "The great thing about this technology is since it's wireless, it can be monitored at a distance," CSA chief medical officer Raffi Kuyumijian said in a new videoreleased by the agency. The members of the XPAntarctik expedition kick off their epic 45-day trek around the icy continent. "People who live in remote communities, for example, will have an easy access to a doctor," Kuyumijian added. "They can have these shirts on them all the time. It can trigger alarms if something wrong is happening, and alert the doctors following at a distance." Indeed, the technology is already used for sports monitoring on Earth. A commercial version called Hexoskin is marketed to athletes as a way of checking out your heartbeat and pace during workouts. It can also be used to see how well you sleep. Astroskin is just part of a trend of wearable technology bursting into the market in recent years. As GPS watches and blood-pressure monitors become the norm, researchers are now aiming for ideas such as headsets that could assist people with vision problems. The CSA has not indicated when Astroskin could fly in space, but says it could be used on the International Space Station during future missions. The orbiting complex is expected to last until at least 2024. Other organizations are also developing advanced garments for use in space. Scientists with the European Space Agency and other institutions, for example, are working on a tight-fitting "skinsuit" that could help astronauts combat the back problems that are a common consequence of long-term spaceflight.